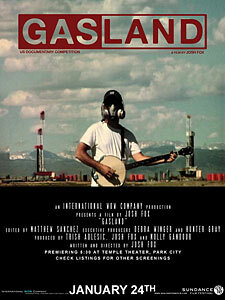 Gasland (Director: Josh Fox): When director Josh Fox receives a letter from a gas company offering him $100,000 to drill on his property, he’s sorely tempted. Until he starts hearing stories about combustible tap water and unexplained health problems from others who have allowed the natural gas industry to exploit their land. Setting out on a personal quest to find answers, Fox travels from his home in rural Pennsylvania to Colorado, New Mexico, Texas and Louisiana to see the results in places where this sort of drilling, called hydraulic fracturing (or “fracking”) has been going on for years. The natural gas industry is, pardon the pun, on fire. Touting a virtual ocean of natural gas under US soil, gas companies have been aggressively drilling wells in order to exploit this energy source as quickly and as profitably as possible. In a bid to become independent of foreign oil, politicians have acquiesced to the industry’s lobbyists at almost every step. The Energy Policy Act of 2005, proposed by then-Vice President Cheney, exempted the oil and gas industry from numerous pieces of environmental legislation including the Clean Air Act and the Clean Water Act. Since that time, fracking has proceeded virtually unregulated, and Fox’s travelogue shows just how ubiquitous natural gas wells have become. Despite admitting to being the son of liberal hippie parents, Fox is smart enough not to come across as a spoiled rich kid from the East coast. His confessional style and banjo playing endear him to both the audience and to the people he visits in the film. These people, for the most part, are average rural Americans, solid Republicans who likely voted in the very same people who gave corporations the right to drill on their land. I’d dearly love to show this film to some of the current Tea Party activists who are campaigning for even less government in their lives. Why aren’t those people picketing outside the offices of EnCana or Chesapeake Energy? Fox does a good job of explaining the process of fracking in layman’s terms and perhaps the most shocking thing about the process is just how much water it uses. Each well drilled consumes 1-7 million gallons of fresh water, which is mixed with chemicals and injected into the earth’s crust to free up the gas. We’re literally sacrificing one scarce commodity to obtain another. To make matters worse (or better, depending on your perspective), when the residents’ drinking water is contaminated, they’re forced to buy water from somewhere else. Privatization of resources is a capitalist’s dream come true, unless of course you actually live in any of these places. And as the film’s graphics show, a huge portion of the United States is either being drilled now or will be in the near future. The gas companies began in the sparsely-populated western states, but are now moving east. Fox’s home is in an area of the Delaware River basin that provides fresh water to New York City, and drilling may jeopardize the water supply of more than 15 million people. And even if you’re lucky enough not to live close to a drilling operation, some of these contaminants have now entered the food supply, as one rancher sadly relates. Farms and ranches depend on water to irrigate their crops and feed their animals, and even if the humans can afford to purchase clean water for themselves, they often can’t afford enough to take care of the needs of their businesses. So we’re all at risk. Even sadder was the revelation that the Bush government approved drilling on public land. So now even a visit to land under the “protection” of the Bureau of Land Management is likely to be spoiled by unsightly gas wells at best, and polluted air, soil, and water at worst. Luckily, the film strikes just the right tone, and there is enough humour and banjo music to avoid making this a completely depressing experience. But Gasland still delivers an urgent message, and it’s one that we ignore at our own peril. This entry was posted in Documentaries, Film Festivals, Hot Docs and tagged #hotdocs10, environment. Bookmark the permalink. I’m looking even more forward to seeing this now after reading your review. Sounds very interesting. This is one of the best films so far. Josh Fox was at the premiere to introduce the film and answer questions afterward. It turns out that companies like Encana (Canadian) are fracking in Alberta and parts of Ontario. I found the film to be totally depressing and shocking at the same time to the point where I wanted to do something after viewing it. A great film. The most frustrating part of watching this film with a Christie HD projector was realizing how poorly it was shot. Poor Josh has to be one of the worst camera operators in the history of film. If he just learned how to use autofocus, the camera work would have been less distracting. Luckily for him, the subject matter is so compelling.